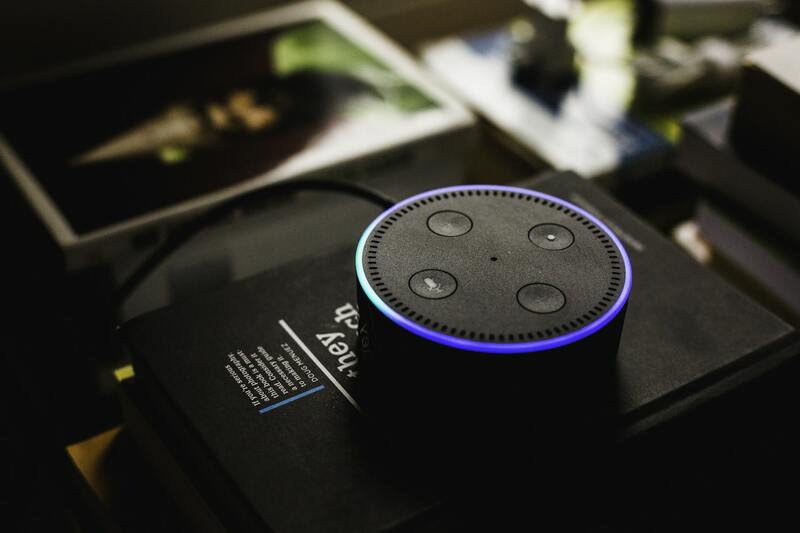 With an array of chatbots springing up in the last few years, major tech companies are deploying chatbots to acknowledge consumer/user concerns ranging from helping them choose the right product or service, to resolve issues faced by users. Most of the service-oriented companies have followed suit and resorted to address the growing user concerns. It may not be surprising that, in the coming days bots can completely replace humans to deliver a better user experience. In this article, we take a look at a .NET Chatbot application used and powered by AWS. The .NET (pronounced DotNet) Framework is a software framework originally developed by Microsoft, that mainly contributed to its Windows operating system(OS) environment. The .NET Framework caters to a vast number of .NET platforms across, right from smartphones to cross-platform OS. The application areas include content management systems in large tech companies and similar web applications. If you use any .NET application, you might encounter terms such as Framework Class Library (FCL) and Common Language Runtime (CLR). The former is a vast class library which helps interpret and interchange code written in other languages such as C++, Visual Basic, C# among others and the latter is a software environment that provides features such as memory management and exception handling. If .NET is strictly used for web services, then another software called Visual Studio goes hand-in-hand with .NET. Visual Studio, as the name suggests, gives a visual representation of the web service required for building an user interface for applications– for example, websites and even chatbots, among many other features. Started in 2006, Amazon Web Service(AWS) is Amazon’s cloud computing arm. It provides services such as storage servers, bandwidth and custom support for Application Programming Interfaces (APIs). AWS is branched into many services with Amazon Elastic Compute Cloud (EC2), Amazon Simple Storage Service (Amazon S3), Amazon Redshift, Amazon CloudFront and Amazon Cognito being the popular picks in commercial usage for cloud. Latest version of Microsoft Visual Studio installed. 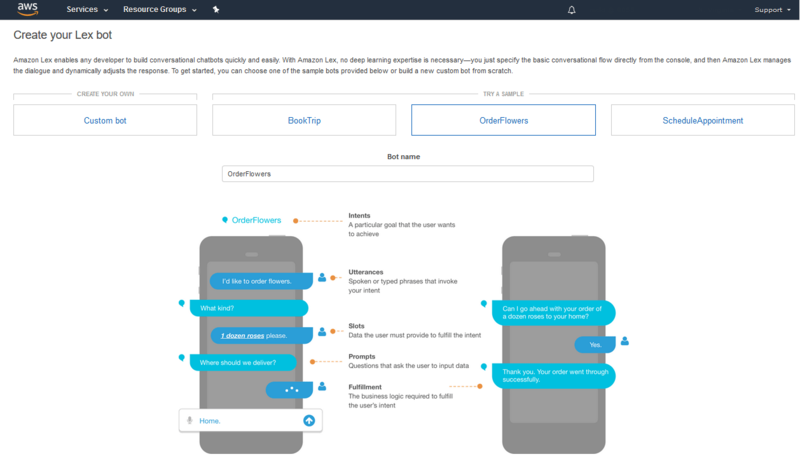 Amazon Lex: It is a primary service offered by Amazon to build a chatbot conversation interface. Lex is a conversation engine that relies on voice and text using natural language understanding (NLU) and automatic speech recognition(ASR) — the facets of deep learning. Amazon’s recent and popular personal assistant software Alexa is powered by Lex. Amazon Lambda: It is a back-end server support provided by Amazon to manage codes without any hassles associated with managing servers. In this case, codes written for the chatbot application in .NET. It supports many coding languages such as C#, Node.js, Java and Python. It has a built-in AWS Software Development Kit (SDK) to assist with the programming. With Lambda, all other services by AWS can be initiated in one go by the user. Amazon Cognito: Another AWS service which offers user authentication and data synchronisation between mobile and web applications. It also deals in providing a secure user interface for logins and guest access. AWS Development Tools and SDK for .NET: The software development tools offered in AWS are plenty to choose from, as per the users’ AWS needs. The APIs are language-specific and almost cover all the domains in software technology including Internet of Things (IoT). The tools are : AWS CodeStar, AWS CodePipeline, AWS CodeCommit, AWS CodeBuild and AWS CodeDeploy. 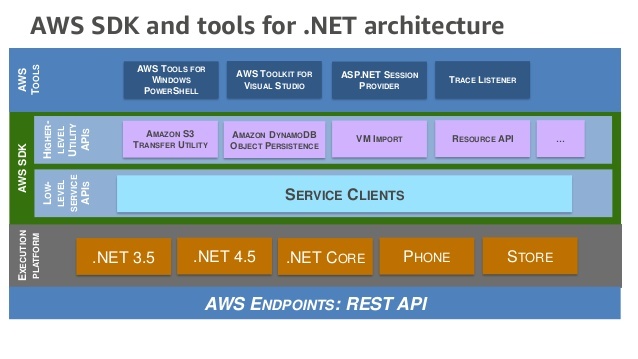 AWS SDK for .NET provides .NET-specific APIs to work with AWS. The AWS services mentioned earlier, will be integrated with a .NET chatbot which is developed prior to using AWS. 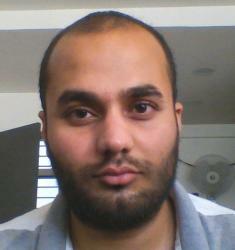 The code is written for Linux and Windows using ASP.NET Model-View-Controller(MVC) Framework. (The .NET Chatbot application used here is for Windows OS only). The AWS web application first is started by specifying the region supported by AWS. Once this is done, a Lex Bot is created by clicking on ‘Create’ button in the Amazon Lex under Machine Learning on the AWS console. You can create a custom bot or select from the sample present in the screen shown below. Remember, Lex is working now on the .NET chatbot. After this, the bot is tested using the Test Chatbot button and is created by clicking on the Publish button. The Lambda function is now created and integrated with the Lex Bot to perform initialisation and validation. Lambda uses a concept called “Code Hook”. This means a part of code usually segregated as a module, can be altered to respond differently. This is done mainly to ensure whether the queries fall under the appropriate pattern for the bot. Lambda function is created using four different options : (1) AWS Toolkit for Visual Studio(for Windows), (2) .NET Core Command Line Interface (3) AWS Management Console (4) AWS Command Line Interface. Once Lambda is created, it is subjected to testing. The testing is run in a ‘Configure Test Event’ module which opens after clicking on the Test button. After this, the Lambda is configured using the following path in the interface : AWS Management Console > Services > Machine Learning > Amazon Lex > Lambda Initialization and Validation. In this section, check-mark the ‘Initialization and Validation Code Hook’ which will present a drop-down menu to choose the Lambda function created. Also, under the Fulfillment menu, the AWS Lambda function is specified. The working of the code is validated for the bot. Step 3 – Using Amazon Cognito to setup AWS credentials. Now, in order to authenticate the bot to work for a set of users, a ‘Federated Identity Pool’ is created using Amazon Cognito. This is setup using the following path in the options present in the screen : AWS Console > Services > Mobile Services > Cognito > Manage Federated Identities > Create New Identity Pool. Once identity pool is created, the necessary parameters such as the provision for enabling access and other parametres. Check mark the options on the menu box which provides these options. A Pool ID is created which displays the sample code. Retain this Pool ID for making changes to access to the bot in the future. Step 4 – Cloning the repository on GitHub and running the project. The code is generally a data repository and is cloned so that there is a copy retained by the user along with uploading it to the server. For this project, it is cloned on GitHub. Then, to provide an Integrated Development Environment(IDE) to facilitate software development in the project, AWS Toolkit for Visual Studio is installed to configure on a Windows system with Visual Studio program installed. After this, the settings can be changed under the appsettings.json file for any changes presented in Step 1, 2 and 3. Also, .NET Core 2.0 can also be installed for testing the chatbot. The user can choose Visual Studio or .NET Core 2.0 Command Line for testing. The bot is now ready to be deployed online. This is done by using AWS CloudFormation template to deploy on the Windows server. Similarly, for Linux/Mac OS, deployment is done using CodeStar and CodeCommit developer tools. The above process may seem intimidating at first for anyone new to building chatbots, but with regular practice and experimenting with the process and code, the working aspects will be a piece of cake. In addition, AWS services are not free, so the user can try working the code on GitHub which is the largest software development platform where users can tinker with codes and software.